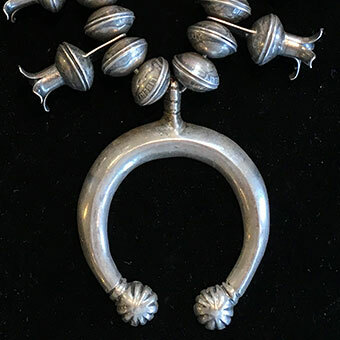 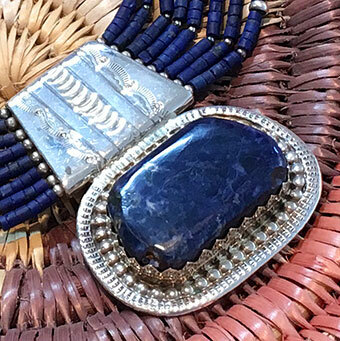 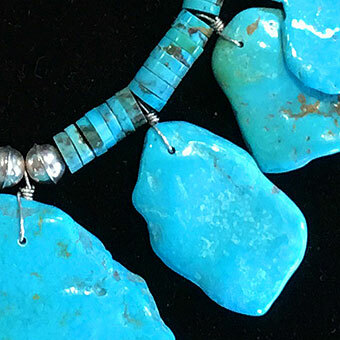 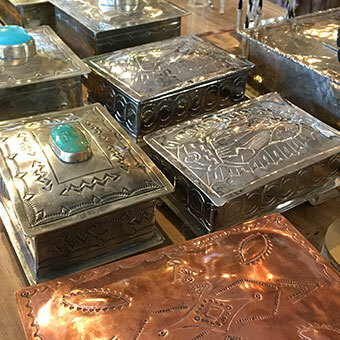 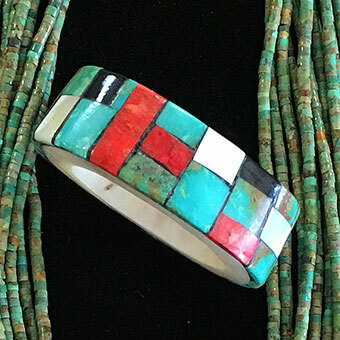 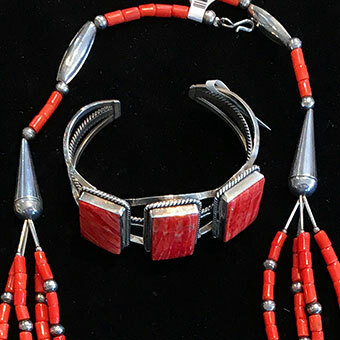 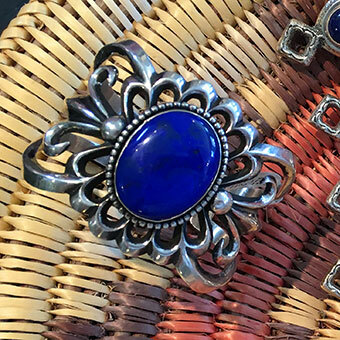 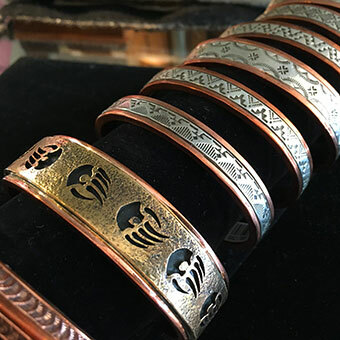 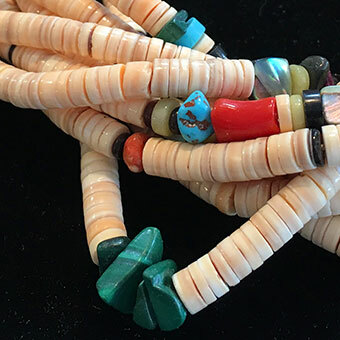 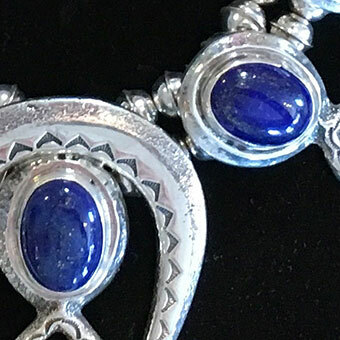 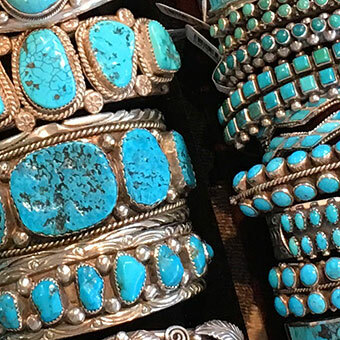 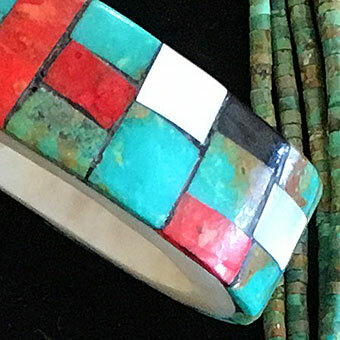 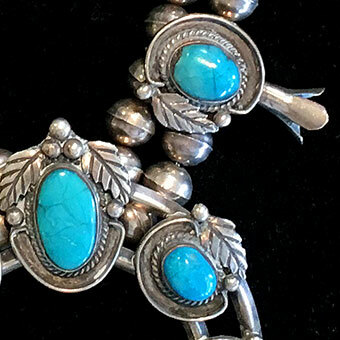 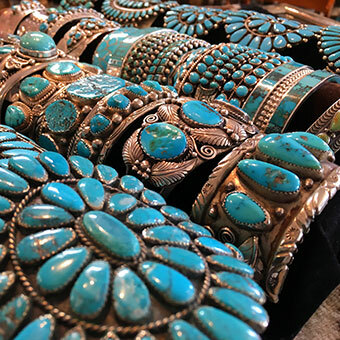 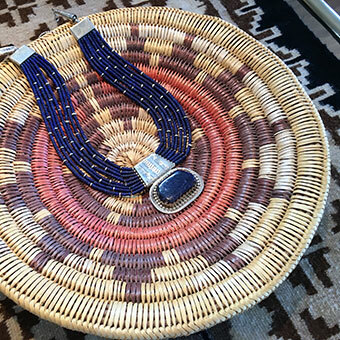 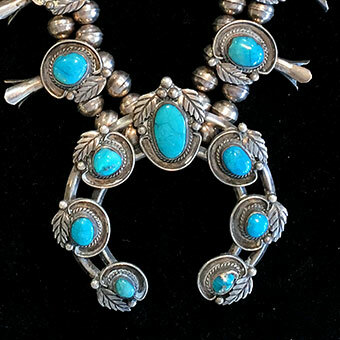 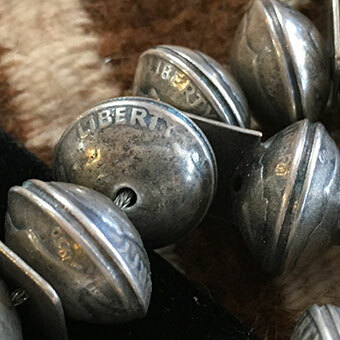 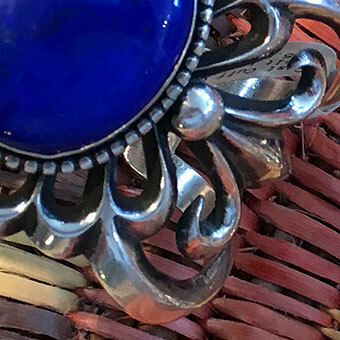 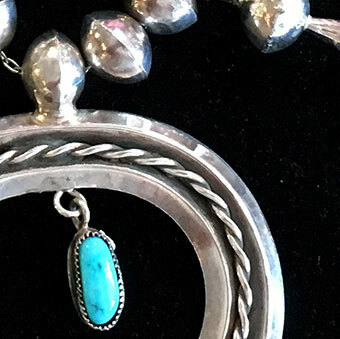 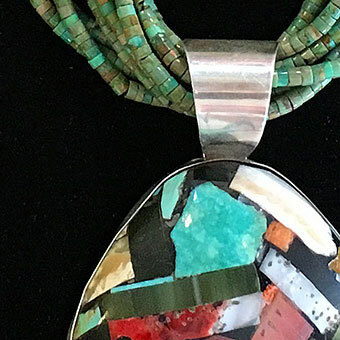 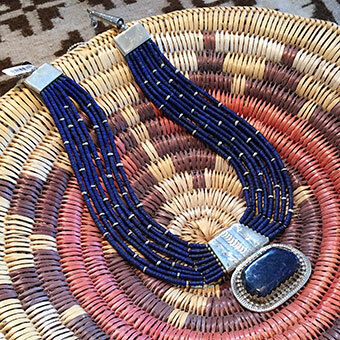 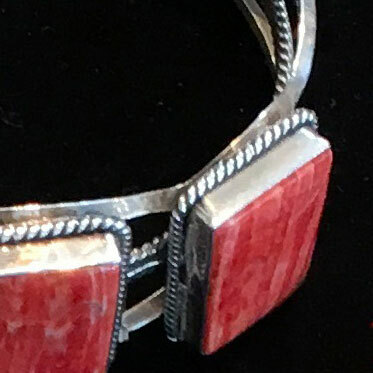 For over 40 years, Bob Scott has been a purveyor of Authentic Indian Jewelry in Grand Lake, Colorado. 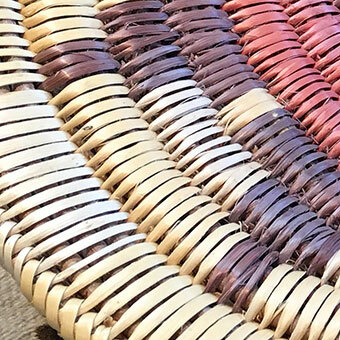 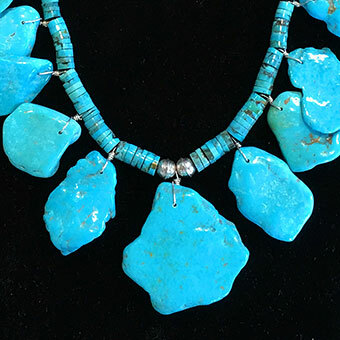 We are pleased to offer the highest quality handmade works of art. 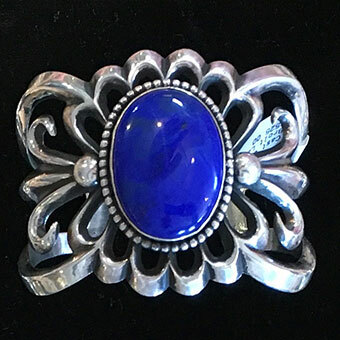 Please browse from the selection of featured jewelry below, visit the shop or contact us if you have a special request. 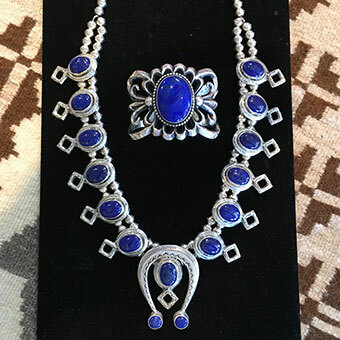 Sand cast squash blossom necklace set with Lapis Lazuli. 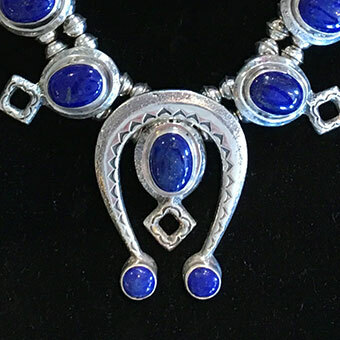 Sand cast Najah also set with Lapis Lazuli. 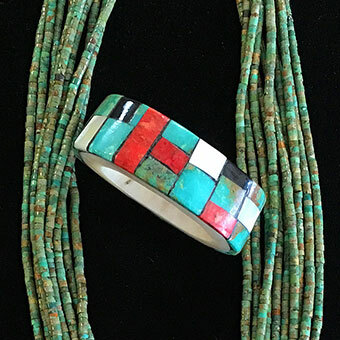 $2100 (shown with bracelet sold separately) Call 970-216-2512 for more information or to purchase. 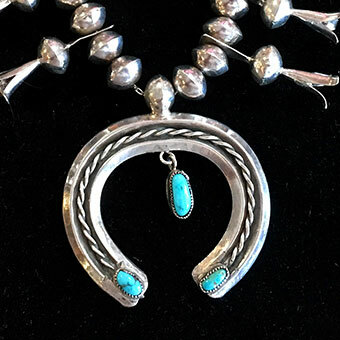 Call 970-216-2512 for more information or to purchase. 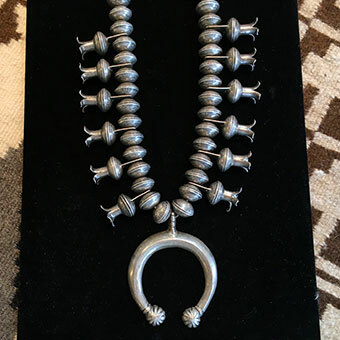 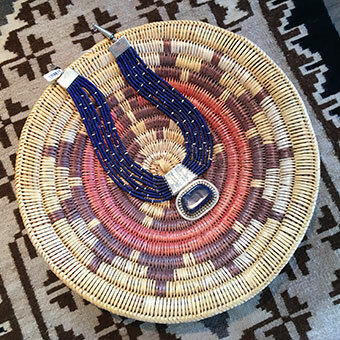 Santo Domingo Pueblo necklace. 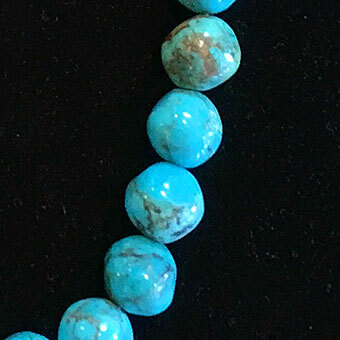 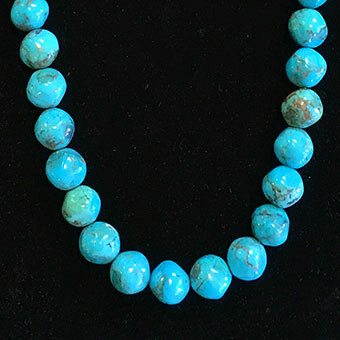 Flat Turquoise nuggets on handmade Turquoise rolled bead necklace. 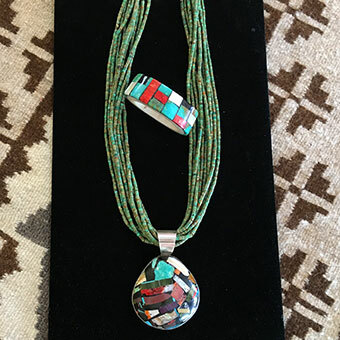 Handmade by James and Doris Coriz. 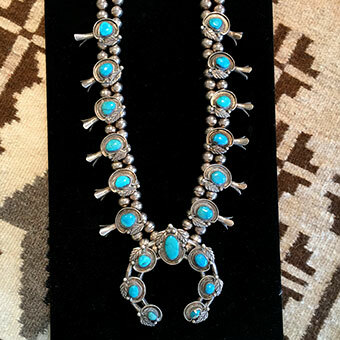 $375 Call 970-216-2512 for more information or to purchase. 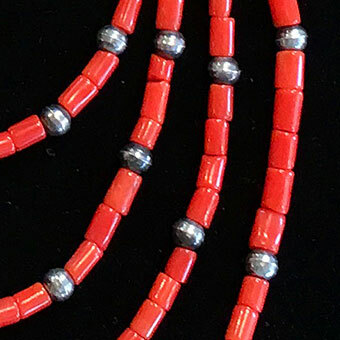 Vintage Red Coral bead necklace. 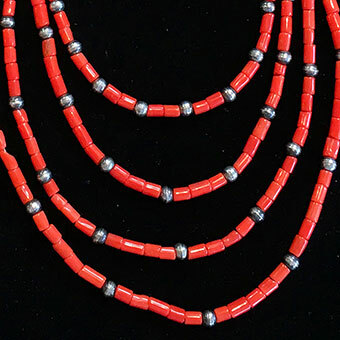 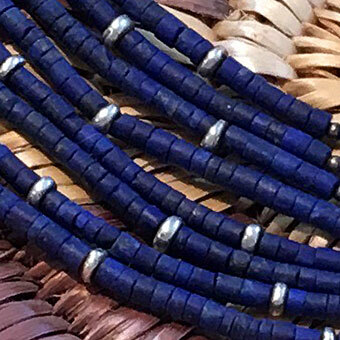 Santo Domingo graduated four-strand, accented with handmade Silver beads. 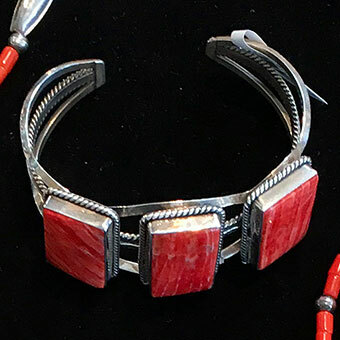 $650 (shown with bracelet sold separately) Call 970-216-2512 for more information or to purchase. 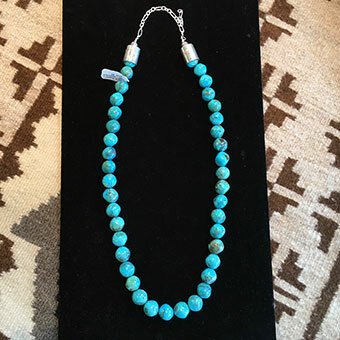 10 strands green Kingman rolled Turquoise bead necklace. 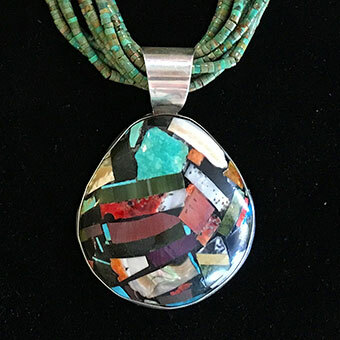 Overlay shell pendant. 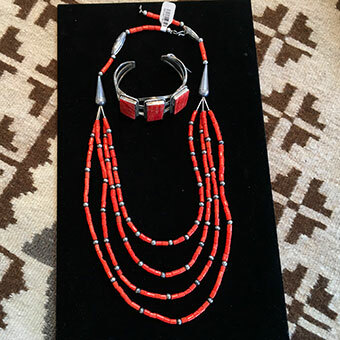 Handmade by James and Doris Coriz. 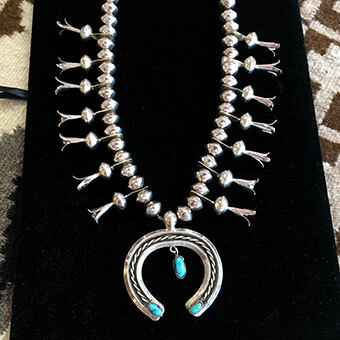 $175 (shown with cattle bone overlay sold separately) Call 970-216-2512 for more information or to purchase. 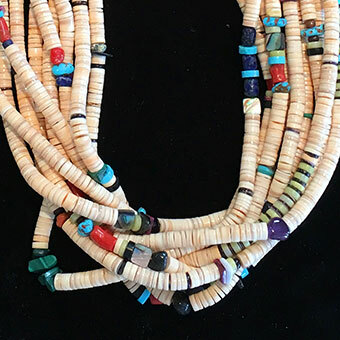 Cattle bone overlay with Turquoise, Mother of Pearl, Coral and Jet pendant. 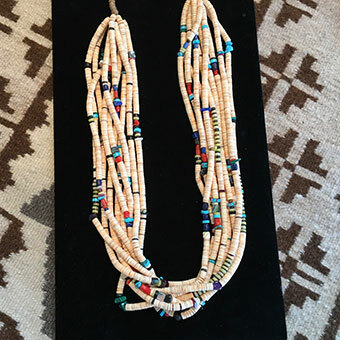 Handmade by James and Doris Coriz. 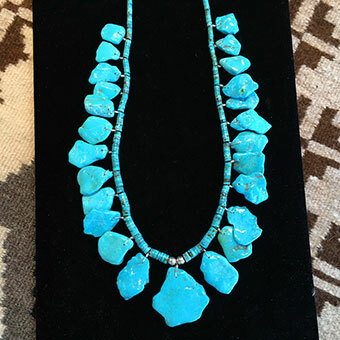 $75 (shown with necklace sold separately) Call 970-216-2512 for more information or to purchase. 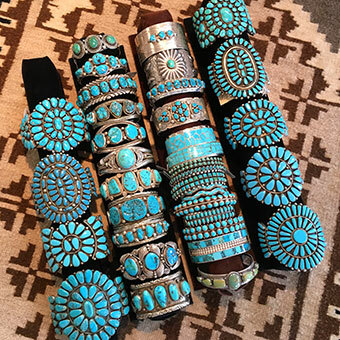 Selection of Turquoise and Silver bracelets. 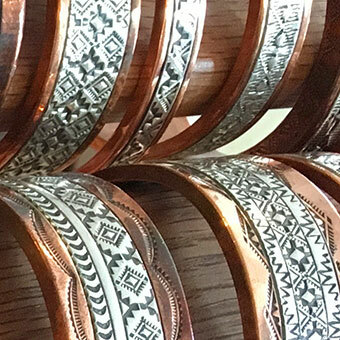 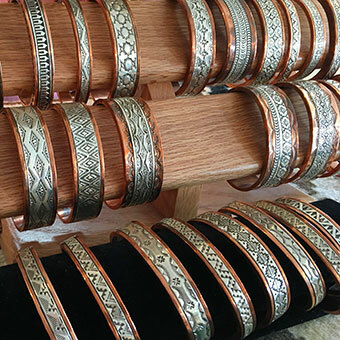 Selection of Copper and Silver bracelets. 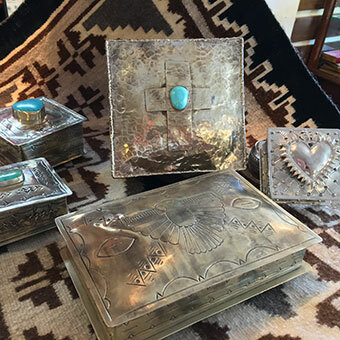 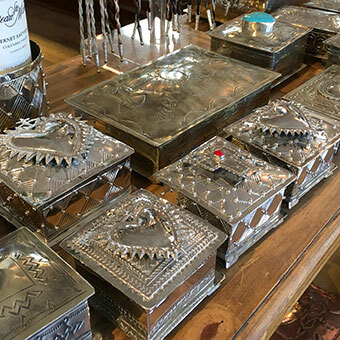 Selection of Mexican Silver boxes.